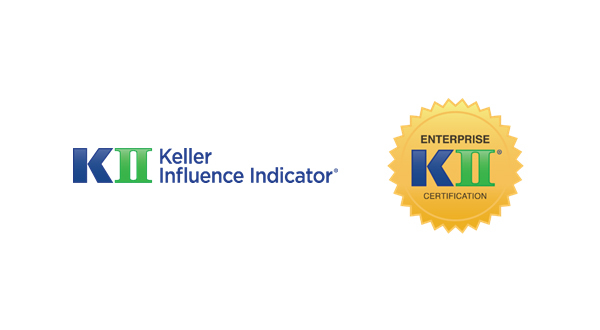 The Keller Influence Indicator® (KII®) Assessment is a statistically validated measurement of influence potential. It is designed to identify areas of strength, influence and human capital assets according to the degree and maximization of the Seven Influence Traits®. The KII® measures and provides scores (benchmarks) for these seven traits; confidence, commitment, courage, passion, empowering, trustworthiness, and likeability. The KII® Program measures influence potential. It is designed to identify areas of power, influence and human capital assets according to the strength and maximization of the Seven Influence Traits®. The KII® Program is sustainable across organizational functions, teams, departments, and executive levels. It prepares the internal environment and culture for unforeseen opportunities and continued prosperity. The KII® generates two reports; the KII® Report which goes into great detail about the strengths, competitive advantage, and blindspots of each of the Seven Influence Traits®. The KII® Summary and Organizational Competencies Report (SOCR™ Report) relates each of the Seven Influence Traits® to how an individual shows up in these Five Organizational Competencies; Leadership, Communications, Team Effectiveness. Strategy & Solutions, and Execution & Evaluation. The KII® Program is used to develop High Potentials, Emerging Leaders, and Teams (sales and operations) across all levels of an organization. The KII® Program is scalable in both the technology and ability to meet the needs of changing educational and business environments. It is designed for potential growth and the capacity to meet market demands of more customers, data, and resources. Delivery of the KII® Assessment and KII® Program has proven to have the capability to adapt over time to changes, i.e., market flexibility, industry parameter changes, and internal customer needs.